Kunqu Opera has had its ups and downs in popularity, reaching its lowest point when it was forbidden during the Cultural Revolution. It is currently enjoying a revival, but sadly the great Kunqu performer Susu did not live to see it happen. However, she still remains a constant presence in the lives of her British family, but in a dysfunctional, unhealthy, Daphne Du Maurier kind of way. Two Chinese students will come to the family mansion for a weekend translation gig, but they will find it is suspiciously hard to leave in Yixi Sun’s Susu (trailer here), which screens during the 2018 Seattle International Film Festival. Qi’an and Aimo are friends and roommates, but there are key differences between them. Qi’an is a good student from a good family, neither of which is true of Aimo. They share a few secrets as well that will be divulged during the course of the film. Despite her family’s status, Qi’an works hard to pay her own way, so she jumps at the chance to do some temp work cataloguing the Stuart estate, starting with rare films of Susu’s performances, while Aimo is happy to come along for a weekend holiday in the country. Their host will be wheelchair-bound Shirley, whose sexual identity, family position, and sanity status are all rather ambiguous. Initially, both women feel better when Susu’s Anglo son Benjamin Stuart arrives. In fact, Aimo rather intends to challenge the largely disinterested Qi’an for his affections. However, she will have a hard time overcoming Qi’an’s resemblance to Susu and its creepy V.C. Andrews effect on him. Eventually, Qi’an is ready to bolt, but strange events conspire to prevent her leaving or force her return. Susu is not a perfect film by any stretch of the imagination, but it is quite enjoyable for the ways it synthesizes various gothic and related influences, including Du Maurier, Andrews, Henry James, Don’t Look Now, Hammer Films, and Giallos. There is also some integration of Chinese cultural elements—Susu happens to be a character name in The Legends of the White Snake (the demon who married a human) while Qi’an arguably represent contemporary archetypes of Chinese expats—but we wish there had been even more Kunqu references. Regardless, Zitong Wu and Zhu Lin are terrific as Qi’an and Aimo, respectively. Frankly, it is a little shocking to see Zhu, who was so touchingly sweet and endearing in 33 Postcards playing the worldly Aimo, but she still lights up the screen. This time (nearly six years later), she exudes sexuality rather than innocent pluckiness. Wu is more reserved, but she conveys a sense of wheels turning in her head. She also does indeed bear a strong resemblance to Junjie Mao, who hams it up Hammer-style as Susu in the flashback sequences. Similarly, Steve Edwin gorges on scenery as the sinister “Shirley,” but it is hard to even discuss such a role in the current climate Social Justice Warrior-contempt for free speech and honest criticism. 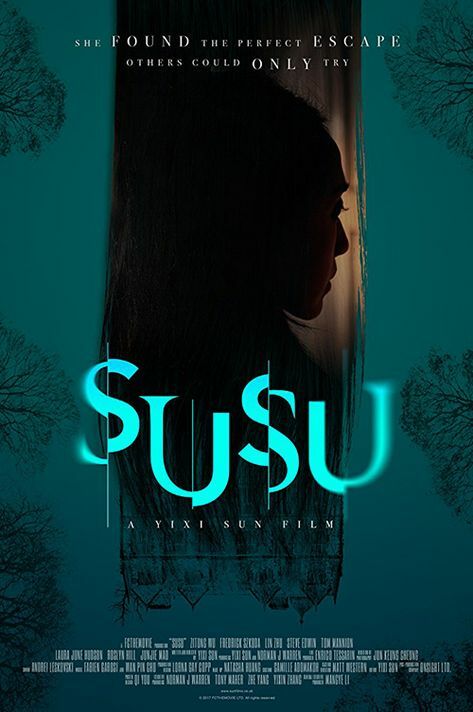 The London-based, Chinese born-and-raised Sun credits British horror director Norman J. Warren as a mentor, which is cool, but Susu is a much lusher and atmospheric film. Although there are too many flashbacks that do not feature Mao, she clearly has a thorough understanding of the British horror tradition. It is just a lot of fun, like watching a stately Jane Eyre adaptation turn into a Giallo. Highly recommended for genre fans, Susu screens Tuesday (6/5) and Friday (6/8), as part of this year’s SIFF.